Startrite's 502E model sits in the middle of their range in terms of capacity and power and could be considered the next step up for many users. 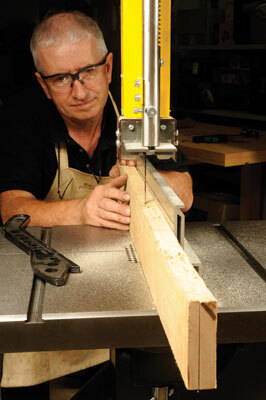 This bandsaw looks and feels like a typical Startrite machine; solid with no frills. I tried the single-phase model, but there is a three-phase if you have the supply available, although output wattage is lower. The first job was to fit the switch block on the side so it was out of harm's way. The cast table swivel mountings are bolted down but may need spanner work if the table needs squaring up to the blade line. 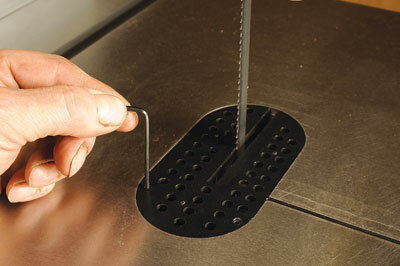 Mounting the accurately ground cast iron table is too heavy and difficult without help. I used a set of grips to tease the mounting bolts out of the table trunnions ready to mount. The chromed tommy bars hold the table down and allow adjustment but as the nuts work loose easily, I would use thread lock compound to prevent this. A steel bar under the table swings sideways to allow blade fitment. Care is needed to unfurl the blade with the teeth in the correct direction. I haven't met a bandsaw yet where blade fitting didn't involve some jiggling to get it into the case and guides and the 502E is no exception. The bandwheels have slightly cambered rubber tyres and are wide enough to take a maximum 35mm wide blade ideal for deep cut veneers and re-sawing. I mounted the supplied 12mm six skiptooth blade in the middle of the wheel, I must admit I didn't check whether the bandwheels were coplanar to each other, a check well worth making with any new bandsaw; the lower axle can be adjusted if need be. All the controls are as you would expect, the tensioning on the upper bandwheel is done via the handwheel underneath it, but there is no lock once tensioned and the scale is a simple stick-on one; the user needs to assess if extra tension is needed. The guides are rather shrouded for my liking; if you can't view the gapping easily, how can it be set right? A well-made bandsaw with a sharp blade shouldn't really need much guidance but I like to think we are all finicky on this point. As access to the cam adjustment for the lower guides is poor and the T-Allen keys struggle to fit, ball-ended would work better. 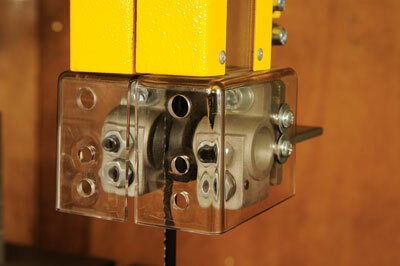 The thrust supports behind the blade are not transverse wheels but hardened steel pegs. 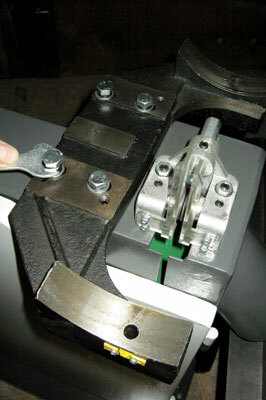 The upper assembly can be moved forward or aft using a spanner under the steel post that holds the guides. Startrite would do well to supply a couple of extra spanner sizes for some of the bolts. The fence is agreeably tall though it can switch around for low work. It can be removed without swinging the table up first. 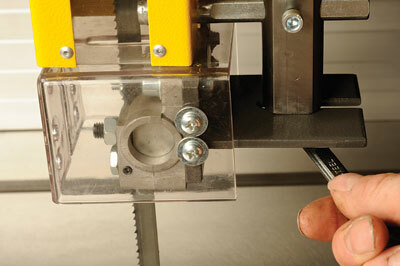 The plastic insert plate has two tiny grub screws so the leading edge can be made exactly flush to allow a smooth run on to the blade. There are two bolts underneath the table that act as stops; one so the table is perpendicular to the blade, the other gives a random angle of about 30º, I think it might be able to increase the angle although Startrite only claim 20º. There is a tool holder at the rear but it won't house all the Allen keys at once. There is a low level extraction outlet and the angled outlet next to the lower guides. Switchgear-wise there is the two-button switch at mid height, which is key-protected and requires the off button to be twisted to reset it each time it is pressed. 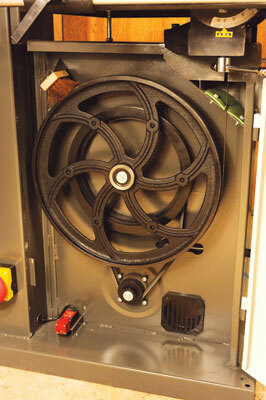 The kick-switch needs to be pulled out to reset and both bandwheel doors are micro-switched. The motor has no DC brake and comes to a halt in its own time. The wheels are free-running, helpful when tracking a blade by hand. A few little complaints with the 502E; the incomplete tool set, lack of full tool storage, lack of clear vision of the upper guides being more of a bugbear. The case visibly vibrates slightly, although the blade seemed to run very evenly with no weaving on the bandwheels. Considering how little setup it had, in particular the lack of table squaring to blade, the cuts were pretty straight with no 'lead' evident. 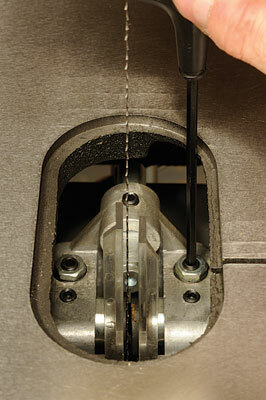 Extraction is an absolute must; without it dust appears quickly everywhere. Although Startrite can supply any blades you want I would add a tipped blade for vastly longer cut life and accuracy, especially as it does such deep cutting. A mitre fence is also a must as it can cut tenons with ease. 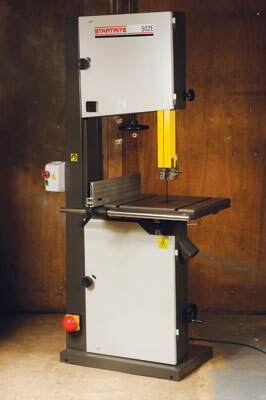 Overall, a big machine with big capacity; a real increase in capability for any workshop.